Air Velocity Sensor Structure: Conventional twisted vane arms and low-friction ball-bearing design. Operating Conditions: Temp: 0 to 50 (32 to 122 ). Humidity: Less than 80 % RH. Accuracy: 3% FS process gas: 32 to 122°F (0 to 50°C); 4% FS process gas: -40 to 32°F 122 to 212°F (-40 to 0°C 50 to 100°C). Temperature Limits: Process: -40 to 212°F (-40 to 100°C); Ambient: 32 to 140°F (0 to 60°C). - 0.2 - 20.0 m/s, high precision for low air velocity measurement, Telescope probe. - m/s, ft/min, km/h, knots, mile/h, oC/oF. - Max., Min., Data hold, RS-232. 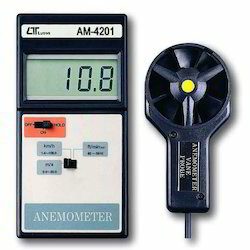 In order to keep pace with never ending demands of clients, our company offers Anemometer.